You need to have the root privileges to run R-Studio Agent for Linux. Unlike R-Studio Agent for Windows and R-Studio Agent for Mac , R-Studio Agent for Linux is a console application and should be run in the Terminal. You also need to mark it as an executable before start. When it is started for the first time, R-Studio Agent for Linux asks for its configuration. Don't pay much attention to the warning about "unregistered demo version". 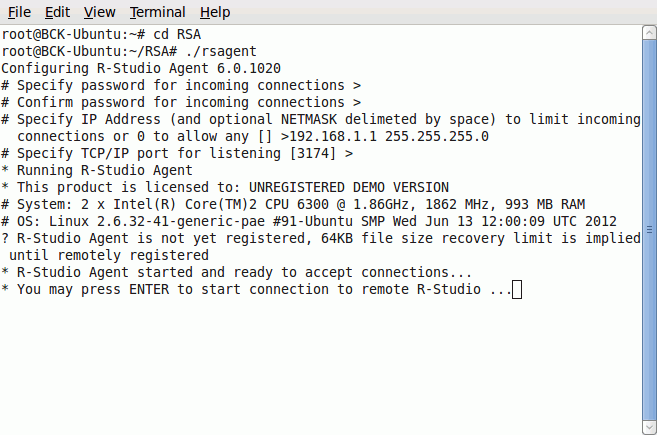 If necessary, you'll be able to register R-Studio Agent for Linux through R-Studio . You may see the current configuration by starting R-Studio Agent for Linux with the command rsagent --show_config . You may change the current configuration by starting R-Studio Agent for Linux with the command rsagent --configure . Connecting from R-Studio Agent for Linux to R-Studio. > R-Studio Agent for Linux will connect to the computer where R-Studio is running and it will show the hard drive and logical disk structure of the remote computer.